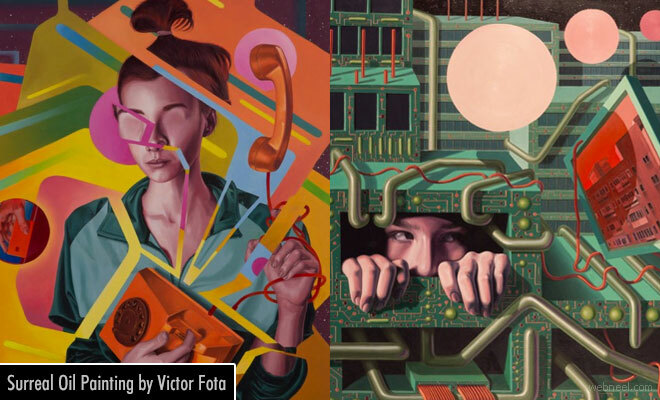 Oil Paintings : Victor Fota is a visual artist from Bucharest, Romania. He was born in 1989 and graduated with a master degree in Art History, department of Conservation and Restoration of Works of Art at the National University of Arts in Bucharest. His passion is in painting and likes to explore sound waves in his oil paintings. Most of his paintings have a pattern as a background, they mostly in lines and circles, which are quite interesting to watch. The patterns are inspired from electroacustic music, such as Techno or Trance, with its' loops and ostinatos. These paintings are realized using oil, acrylic and tempera on medium to large surfaces (canvas and rarely, hard paper). His paintings are a combination of old Flemish methods of specific forms and successive glazes of paint. According to his biography, "His works are separated in three major concepts; “Two Grounds” which was the first personal exhibition in Bucharest, “Reality through Reason-Cosmogony” the second one, and “Human Extension” which is in progress and will be displayed in 2016 at Galateca gallery in Bucharest. The most recent series of oil paintings, have a concept based on the relation of man and machine, called Human Extension, in which the artist explores this relationship using facts and imagination, resulting in a surreal image".